Measurements collected using AirVisual’s continuous light scattering sensor were compared to the measurements made using reference Beta Attenuation Monitor (BAM) data, computed by the US embassy and the Chinese government, between the 1st of June to the 30th of June 2015. The aim of this investigation was to analyze the accuracy and precision of the AirVisual (AV) sensor in measuring the mass concentration of airborne particles with an aerodynamic diameter of less than 2.5 𝝁m. 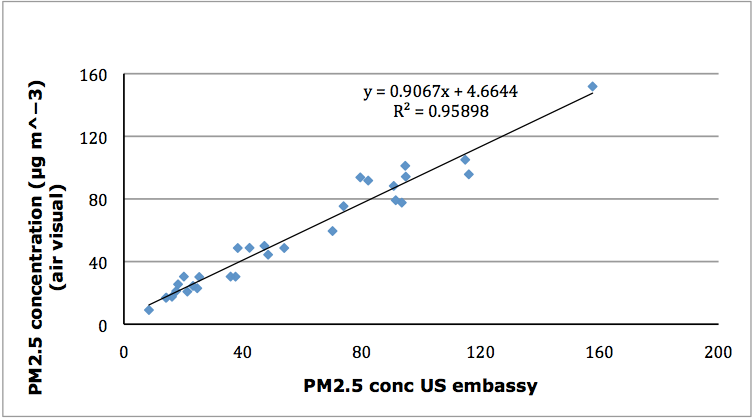 The PM2.5 measurements made by the AV sensor and the BAM sensor were found to correlate well, with a daily and hourly correlation efficient of 0.96 and 0.83 respectively. As such, the AV sensor appears to be suitable and reliable for real time continuous monitoring of PM 2.5. All of the instruments were operated in Chao Yang district, Beijing. The data from BAM is measured at the United States embassy, which is located at 55 Anjialou Road. The distance between the AV to the US embassy sensor is approximately 2.5km. The AV detector was located at a 20m-height balcony, facing the residential area, to ensure the data collected by the sensor was not affected by automotive traffic pollution. Monitoring was conducted from the 1st of June (18:00) to the 30th of June 2015 (15:00), for a total measurement period of 30 days. The concentration of PM2.5 was monitored during June due to the high variation of the PM2.5 concentration. A quantitative method to compare data was used to gain a visual sense of the data’s precision by using a time series plot, as displayed in figure 1 and 2. 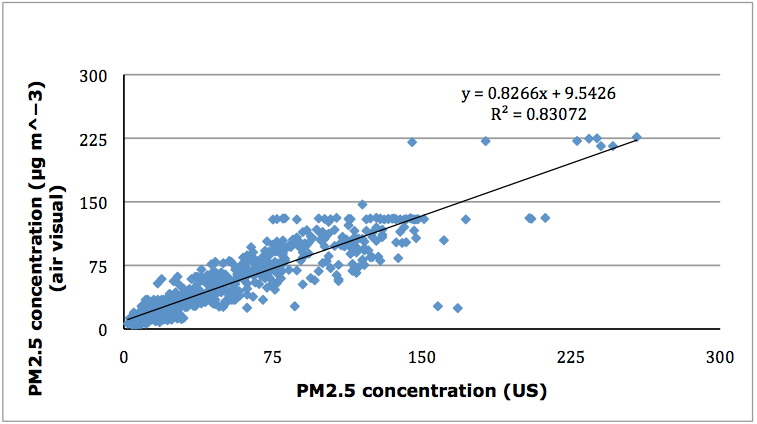 Average PM2.5 concentration was calculated from the data recorded every one hour. 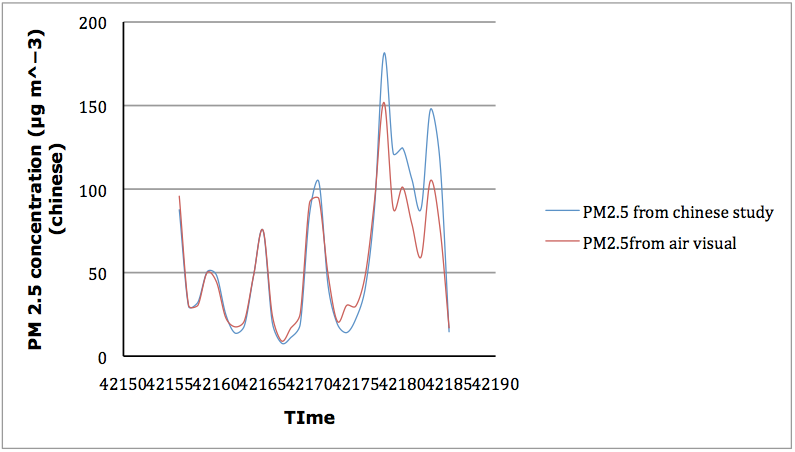 PM2.5 concentration recorded between both instruments was slightly different. This is due to different detection methods between both instruments, as AV used light scattering and BAM utilized beta ray scattering. In addition, the response time of AV and BAM is different, in which, AV was set to record the concentration every one second, while BAM records the data hourly. A total of 694 pieces of data were captured. 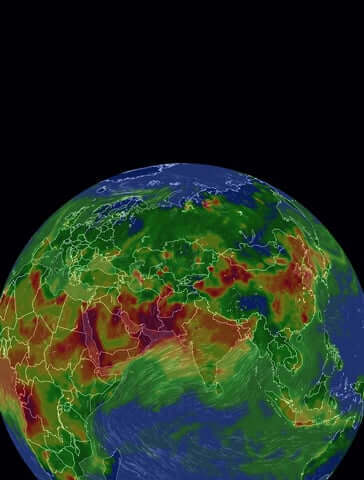 The average PM2.5 mass concentration was distributed between 0 and 250 𝝁𝒈𝒎−𝟑. In general, there is a similar concentration trend for AV and BAM. Two statistical analyses were used to compare concentrations from AV and BAM. One was to compare the hourly difference between the two instruments as both an absolute concentration and percentage. The second method, compared AV to BAM using a linear regression analysis. While the hourly relative difference between AV and BAM is found to be 26.1%. Higher accuracy can be driven if you neglect outliers such as any concentration below 20 𝝁𝒈𝒎−𝟑. The lower the concentration level, the higher the uncertainty. The purpose of linear regression analysis is to explore the relationship between corresponding measurements of AV and BAM across a range of concentrations. The regression procedure determines the “best’ available straight line for describing the relationship and the regression coefficient explains the correlation of the data. Figure X shows a comparison of the regression diagram. The average coefficient of correlation squared (r2) of average daily measurements between AV and BAM was found to be 0.959. The slope was 0.9067 and the average interception was 4.6644. The agreement between the daily measurements is very good as the slope is close to 1 and r2 exceeds 0.9. However, based on the hourly measurements, the slope is approximately 0.822 and r2 is 0.83, according to figure 4. Although the hourly data deviates more from the 1:1 line compared to the daily measurements, r2 of 0.83 indicates a fairly strong correlation between concentrations of AV and BAM. Whilst the correlation between data from the Chinese government and AV shows a high r2, with a value of 0.93, the data deviates more from the 1:1 line more with a lower slope (0.83) and a higher intercept (9.54). 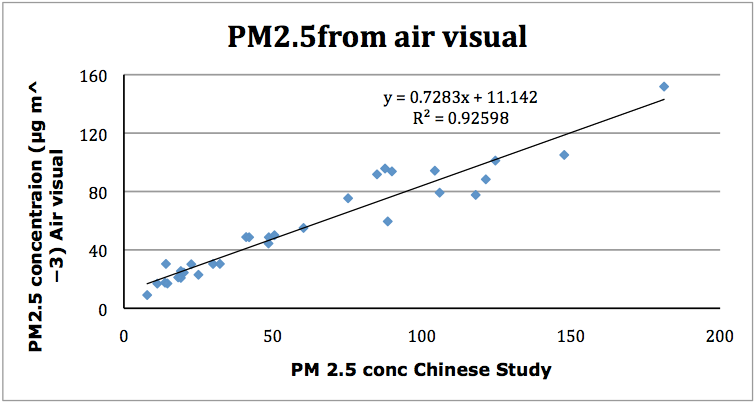 This investigation and accompanying figures illustrate that the calibrated light scattering detection device, the AirVisual sensor, is useful as an alternative instrument for monitoring PM2.5 concentration levels. Despite the low cost of the AirVisual sensor, the results from the present study suggest that the AirVisual measurements are reasonably precise, with (R2=0.83) compared to BAM, though the AirVisual sensor may still be influenced by factors such as changes in particle characteristics. John V. Molenar. 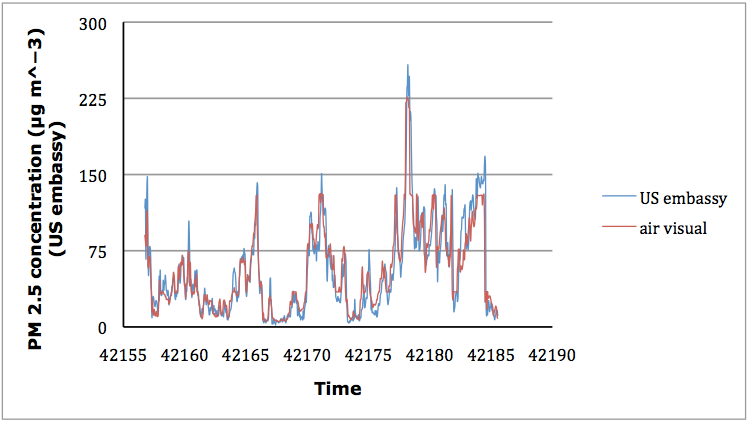 Theoretical Analysis of PM2.5 Mass Measurements by. Nephelometry. Air Resource Specialists, Inc.